Writing about the same "old combatant for liberty" Hem Day later recalled that " he is not well known to all, even to our own people, for he has neither the fame of Gandhi, nor the fame of Nehru, nor the popularity of Vinoba, nor the notoriety of Kumarapa, nor the dignity of Tagore. He is Acharya, a revolutionary, an agitator, a writer." M.P.T. Acharya was born on 15th April 1887 in Chennai into a Bhramin family. From early years he was involved in the nationalist struggle. He edited a nationalist magazine for his uncle. When the periodical was suppressed by the colonial authorities Acharya had to escape to French controlled Pondicherry. Sensing he was not safe there he left India and landed in France. He soon moved to London and joined the Indian House with V.D Savarkar, Madan Lal Dhingra and other Indian nationalists. When in 1909 Dhingra assassinated Sir William Hutt Curzon Wyllie the Indian House soon disintegrated. In next few years he visited Berlin, Munich and in November 1911 was in Constantinople to gain Muslim support against the British. In 1912 he moved to New York and in 1914 to San Fransisco, where he edited the Tamil edition of Gadar Party's periodical. Gadar Party was set up a year ago, with help of his friend and IWW member Har Dayal. Har Dayal had spent time with Emma Goldman and when in 1914 Dayal was deported for being "an anarchist" Emma protested and wrote about it in Mother Earth. It was during this time Acharya saw the real face of Western Democracies and stood against the notion of nation states. “Is it to make large cities with miserable people, barely eking their existence that we want to have 'Swaraj'?” He asked. ”I consoled myself by answering that the misery was due to foreign Government, but under Indian Government, it would all vanish, because our countrymen will be friends of the poor when they come to rule. Late on, however, when i went to Europe and saw misery there, my illusions about "National" rule were shattered." Acharya spent the World War period in Middle East and in 1917, with Virendranath "Chatto" Chattopadhyaya, attended a socialist peace conference in Stockholm. Where he met prominent Bolshevik leaders and in 1919 met Lenin. In 1920 Acharya helped form and became Chairman of the Communist Party in exile, with M.N.Roy as Secratary. Acharya was kicked out in 1921 for his criticism of the direction CPI was taking under the Comintern and Roy's autocratic behavior. “We are Anarchists, because we do not want authoritarianism outside or inside, because to us anti-Marxists, life and society must be, immanently – one indivisible whole impossible of mechanical separation – as the Marxists inorganically think and believe.” "Communism can come only through and beyond Anarchism not before and behind it, as Lenin predicted and died broken-hearted and mad." From 1923 onward, Acharya was in communication with Emma Goldman, Alexander Berkman, Taiji Yamaga, Lu Jianbo, Rudolf Rocker and many other anarchist, but most prominantly with Albert Meltzer - whom he met only twice but maintained a regular correspondence till his death. 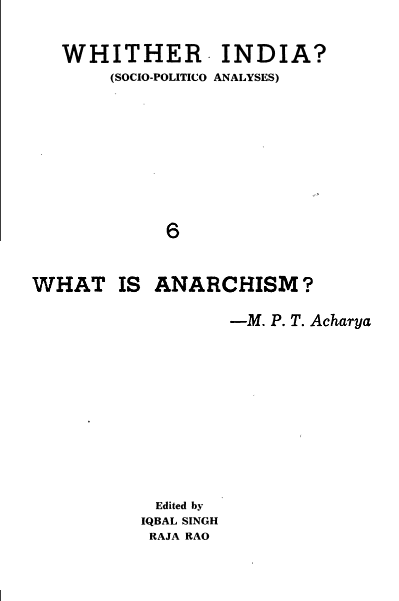 Acharya wrote for American, Russian, French, German, Spanish, British anarchist journals and newspapers on the topic of economics, India, anarchism among others. When he returned to India in 1935, he also started writing for Indian publications, including Gandhi's Harijan. About Gandhi, he wrote that "Gandhi is more opposed to the violence of the mass liberation than the violence of governments." He admired Gandhi as a tactician and also independently formed his own "logical pacifism." Acharya set up the Libertarian Socialist Institute and published many anarchist classics and new material in Bombay. Commenting on Acharya and Indian Left, Meltzer wrote that "it was impossible to comprehend the difficulty in standing out against the tide so completely as was necessary in a country like India. It was easy for former ‘nationalist revolutionaries’ to assert their claims to the positions left vacant by the old ‘imperialist oppressors.’ This Acharya would not do. He remained an uncompromising rebel, and when age prevented him from speaking, he continued writing right up to the time of his death." Acharya warned as early as 1945 that Nehru and Patel "goes around like emperor, and speak like emperor." And that "[w]ithout an anarchist movement this country will go Fascist and go to the dogs." "Despite all of his efforts Acharya remained an isolated Anarchist in India and failed to create a movement. Whilst nationalists like Har Dayal and Bhagat Singh had a knowledge of anarchist texts, they merely incorporated what they felt to be useful to the struggle against British rule into their thought. Nationalist, and to a lesser extent Communist Party orthodoxy, had too much of a grip on the Indian masses, and unlike elsewhere in Asia, an anarchist movement did not develop, much to the chagrin of Acharya"
"With a growing interest in anarchism among Indian students, a Bombay publishing house reprinted many classical Anarchist works, but Acharya did not succeed in building a movement before his death, nor do I think one exists yet." 'What is Anarchism?' first appeared in Withering India edited by Iqbal Singh and Raja Rao in 1948. Most of the texts in the volume were written exclusively for it and other author included Nehru, Jinha, J.P. Narayan. Some words that might cause confusion have been updated to current usage, while others that are still understandable are kept as they were. Writing in 1940s Acharya was using non-gender-neutral terms while talking about the species as a whole. Comments in square brackets are by me. I would like to thank Ole Birk Laursen and other scholars who have helped dig up and bring back to light MPT Acharya’s life and ideas. A collection of Acharya's works will be published by AK Press in 2019, thanks to Mr. Laursen. ARCHY means Government, rule, state—ANARCHY means non-rule, non-government, non-state. The Anarchists want non-rule, non-government, non-state. They want a non-governed, non-ruled, non-state society. Here, anarchism is the antithesis, the opposite of all other-isms. It negates fundamentally the necessity of all states, whatever their form. While in other-isms they try to find a synthesis between State and Society, the anarchists believe, consider and think that the State is the enemy of Society, i.e. the state will suppress the society or the society will have to suppress the state. That means the two cannot be co-existent. They therefore negate the theory of the State being the collective will of the Governed, whether it is the liberal or democratic state, or the absolutist and dictatorial state, whatever the extreme form, i.e. whether the Fascist or Marxian state. All states are dictatorial—preliminarily or ultimately. No constitution can be established except by violence. The most democratic constitutions had a violent rebellion before them to eliminate the previous rulers and states, and under that violence, new constitutions were formulated and established. Therefore the claim that constitutions are established by the free will of the people is incorrect. If the states--or any states—were non-violent, where is the necessity for armies, police and jails? The last arguments of all states are the army, police and jails. Every constitution is protected by army, police and jails. As much as autocracies! No state can exist without these. There is no constitution which says that no army, police and jails should be used. In fact, the emergency of danger to state can be proclaimed by all constitutions. What is emergency is a matter of interpretation by states and parliaments. When, as is generally done under constitutions of the freest kind, the emergency is proclaimed to exist, all constitutions are suspended, and the army, police, and jails come to defend the state and constitution. Peter Kropotkin, once a prince and later an anarchist, declared in his “Appeal to the Young", what is the use of constitutions when martial law can be declared in defense of the State? When the rebels make trouble, the constitutions are shelved and the state is managed and defended by violence in the name of the will of the people.” States thus create civil wars, even constitutional states. When the different parties and interests agree to rule together, there is constitution, when they fall out, there is civil war and suspension of constitution. The states born of violence cannot defend themselves without violence. Thus a non-violent state does not, cannot exist. All states in essence are violence, concentrated violence over society—whatever their forms and shades, just as much as autocratic absolutist kings are. To speak of non-violent society and state in the same breath is mutually contradictory. Non-violent society can therefore come into being only with the abolition or “withering away” of states of every kind. Therefore to produce a non-violent society, the anarchists work consciously, instead of leaving it (as Marxians do under the excuse of "transition stage") to time and chance. All states refuse to wither away and try to perpetuate themselves as long as possible. The anarchists are therefore the only ones who want to abolish violence over and within society. They want that to be done deliberately. There will be eternal war between state and society and finally the state will not wither away but will be suppressed—that is the anarchist thesis. The object of evolution is for the society to get on without state and rule from without. The anarchists want everyone to help evolution to that end consciously and deliberately. The anarchists maintain all governments are established and maintained only by a minority. Even under constitutions, States are violence by a minority over the vast majority, whether the states and constitutions are accepted voluntarily or enforced with the help of violence. No state can be conducted by all. Only a minority will be allowed to bear arms, even if the majority are allowed to vote. Only a minority will be allowed to manage the state. It cannot be done by a majority by, or after, delegating powers voluntarily, or after deception and compulsion. The anarchists want all to be rulers in their own right. They do not believe that there can be identity of interests between the representative‘- and represented. The representatives will serve their own interests even at the expense of the represented. Thus deception and force will prevail. The represented will be finally suppressed by their representatives. The representatives cannot be identical with the represented. Hence proxy-Government is not self-government by the people. In order to have self-government by the people, each has to represent himself directly. That can be done through no state, however radical. The anarchists mean by non-state (anarchy), government of society by society, by all members of the society. That cannot be done by a representative government which can only be centralist. Government is always centralism—finally despotism of the centre. Even the most “federalist” or “decentralized” Government like the Swiss, is in the last resort centralist and therefore despotic and cannot be of the people and by the people, therefore for the people. Centralist democracy is a contradiction in terms. Either centralism or democracy is possible; mixing both ideas which are as poles apart is nonsense. No Government can afford to be decentralist and federalist: The autonomy of the parts is an illusion. In most essential matters, even the most “decentralist" government like the Swiss is centralist, it decides as it suits the state best even if it means the curtailment of the liberties and violating, overriding the interests of the autonomous parts. On any essential question, the central state is for itself. Decentralization and federalism means absence of government which means centralism. So non-government is both decentralization and federalism—the essential condition of both these. Decentralism and federalism will destroy centralism or centralism will destroy both. There can be no compromise between the two principles which are antitheses. The anarchists go to the logical limit. The anarchists not only want decentralism of regions into local units but also distribution of power, decentralism of power, the making of every one in each locality his own master and representative. The power finally is vested into each individual. Of course, they recognize the necessity for delegation of power, but conditionally and in the locality-—where alone the representatives can be under the watchful eyes of all. Every government can be only by a section of the society against all the rest. There can be no people's government possible, except under anarchy. People (society) or Government but not people’s (or social and socialist) government. The anarchists, when they insist on non-governed society, mean government of the people, by the people, for the people,—directly by the people themselves without any intermediary. Society ruling itself, not ruled by a part over itself, which can only be done with violence. Every governmental “society” is divided into the rulers and the ruled. There are classes among such a society, the largest classes being those who are for the government or against the government. The Government can only be in defense of itself in spite of a class supporting it. The class represented by a government is not all defended equally by that Government. The nearest and most satisfied by the Government is its bureaucracy: Government is bureaucracy, can only be bureaucratic. In the Marxian so-called class-state, the Bureaucracy and Party come before all workers, for they are the mainstay of the State and Government. There cannot be even a class state, for all the class cannot conduct the state-after delegation of its powers. Especially as every state is centralist, i.e. despotic. There are gradations of class as there-is gradation of income in every class. With such gradations, there is and can be no solidarity and identity of interests, even in one class. The so-called neutrality and justice of the state is but the neutrality of the monkey towards the quarrelling cats. There will be no cheese left for the quarrelers who go before the state for justice. The state will manage its own affairs first and foremost at the expense of the “class brothers”. The state is above those whose interests it is supposed to protect and defend, it is outside the pale of its own class. Thus the dictatorship of the proletariat through the state of the advance guard [avant-garde?] (communist) party becomes inevitably the dictatorship over all the proletariat. The party state cannot represent even the interests of the members of the party which supports it. The state is independent and over the party. The state of whatever form and name cannot be otherwise, since it can only be run by a bureaucratic, microscopic minority and must rule. The state is the part, but society means whole. Even a class means whole—all members of the class. The theory of state metaphysicians is that the part which is made to represent the whole is identical in interests with the whole, is even the whole. But a part can never be equal to or identical with the whole. It can only be separate from the whole, independent of the whole in the name and under pretext of being delegates of the whole. The whole will go under the part whether this is erected or not, whether it assumes its role of a delegate by force or fraud. No Government can be identical in interests with the people, even with that of the class it pretends to champion, even if these accept and elect it. People or state, class or state—not both together. The people or the class must serve their own interests without the intermediary of anybody, all representation is illusion. But that cannot be done through elections and constitutions which delegate authority to a distant body. Hence the anarchists want only local elections where the delegates will be under the electors’ control and direction. Distant delegates cannot be controlled. Hence they want no state and no centralism which can only be distant. So far they are realists. All others hallucinationists. The anarchists want freedom, democracy and socialism. But they consider—nay are convinced, these cannot be obtained or maintained under state protection or direction. The states are therefore the enemies of freedom, democracy and socialism, for in the last resort they are despotic and only for the bureaucracy. There can be no Government which is not bureaucratic, i.e. bureaucracy and Government are interchangeable terms. To fight bureaucracies and keep governments is hopeless, since governments breed bureaucracies, red-tapism, red tape itself. People alone, if decentralized administration under local control and management is established, can conduct affairs without bureaucratism, because all things will be above board and under the eyes of the local people at all times. What is in their interests and what is not can be detected, corrected and decided at once. Socialism is social ownership and management, i.e. ownership and management by society and people. Since states cannot be identical with i.e. be the same as the people, the state being an organ of the bureaucracy--a minority, social ownership is negation of state ownership and vice versa. We can have either state ownership or social ownership and management. But it is supposed that state ownership is in fact social ownership and management. It is Gandhiji’s Trusteeship theory in another form, the part which is government represents the whole and therefore is the same as the whole, hence is identical with the whole society! Pure logical nonsense. The socialist anarchists who form the majority of the anarchist movement are therefore both against private and state ownership and management. There are individualist and associationist and group anarchists who do not believe in socialism, i.e. ownership by the society as a whole. We have also anarchists who are individualist capitalists and they are even for one man or group Bolshevism. They want their own or their group interests above all others’ interests, even if it is against others’ interests. But the vast majority of anarchists are for socialism, either as pure anarchists, as anarcho-communists or as anarcho-syndicalists (trade unionists’ ownership and management). They are all at one about states and state ownership and management—against them as negation and suppression of socialism, i.e. of social ownership. The states being run by minorities and infinitesimal minorities, state ownership is no improvement but even worsening of private monopoly, for in private monopoly or ownership, there will be still competition between individuals and groups, whose rivalry to ruin each other may give to others some loopholes of liberty from time to time, but under a monopolistic economic system, all will be crushed into a uniform mass of slaves for the service and benefit of the bureaucracy which is independent and armed with all means to suppress all. The anarchists claim that state ownership cannot lead to socialism, since the so-called socialist state will prevent the society from owning anything. (Whether it will benefit the slaves materially is another question and on this point, the anarchists think it can only reduce the standard of living of all in order to maintain the state, as the state reaps by its monopoly the surplus value or profits as much as it can.) Anyway the combination of political (i.e. state, army, police and jailing) power with economic monopoly will end in absolute despotism of a clique. It will be absolute centralism. The anarchists are more dead against State ownership than even the capitalists. They are more inimical to Bolshevism than the capitalists are. The capitalists have at least a common platform with the Bolsheviks on the state issue—and therefore both the capitalists and Bolsheviks are the deadly enemies of anarchists. The capitalists are individual or group Bolsheviks while the Marxians are collective capitalists. The anarchists are against both forms of capitalism. Only the capitalists and Bolsheviks agree that Bolshevism is socialism, which the anarchists deny. They call Bolshevism the worst form of capitalism. Bolshevism is monolithic capitalism managed by a few monopolists. All therest are their slaves who can be killed outright if they are useless for the state and its monopolistic parasitic economics. No elections and Soviets change this fact. Every liberal and democrat is a bit of anarchist, for he does not want the complete mastery of his life by the state machine. The anarchists agree with Jefferson that the best government is one which governs least. But they claim that the logic of it is that non-government is the best form of “government”: Society itself as government, Government of society by society. As regards laws, on the necessity of which both Bolsheviks and anti-Bolshevik capitalists agree, the anarchists believe like Lenin: Laws without force or violence to apply them are no laws, are ridiculous. Only Lenin said that to create a force or violence to maintain laws and enforce them, exactly like Capitalists. But the anarchists say that because laws have to be enforced with violence, laws are not instruments of non-violence, are not non-violent and if force has to be applied to maintain laws, what is the use of all laws? Force alone is enough to maintain the state. In fact, all constitutions and laws are but veils over force and violence behind them. And force consists in army, police and jails, the last line of defence of the states, their constitutions and laws. But these are necessary for a divided society, to maintain it divided. Lenin observed that just as there are class laws in capitalist countries, there must be class laws in Russia: Just as they suppress workers in capitalist countries, the Bolshevik state must suppress capitalists. He was logical from the state-mania standpoint which he maintained. Only that is not calculated to abolish the class structure of society even under the proletarian state: In Russia, there are two classes, the ruling party which employs proletarians and the ruled who have to work for wages. In Russia also, owing to the state monopoly of all things, in spite of the claim for social ownership, there are laws against theft (of course, of state~property!) The state is the owner, the rest are wage slaves. Where is social ownership, except as proxy-ownership? Political power is proxy-power and state ownership is proxy ownership. In both cases, the proxies are the real ones in power and the real owners. That is where a "representative system" leads to. There can be no social ownership with political state, hence there can be no social state, as socialist states are supposed to be. All states are parasitic and anti-social: Only the ownership changes for worse. Hence the anarchists refuse both states and state- ownership. They want ownership by all the society. A part cannot own anything for the whole society, politically or economically. It will own all things for its own benefit to the neglect of others, suppressing them to keep the benefits to itself. The means will become the object to the part called state. The anarchists do not want confiscation, which means taking over by the state. They stand for expropriation which means in their view collectively taking over the land, soil and means of production. They do not want that only a class should expropriate, for that would mean making another class the master: They want all the society to expropriate all things. The anarchists want the immediate abolition of all classes while the so-called socialists and Marxians believe in gradual abolition of classes during a transition period. There can be no transition between capitalism and socialism, for these are opposites without a bridge between them. The one or the other is the only possibility. Once the owners are expropriated by the society, none is a capitalist or monopolist. The class distinctions are thus at once abolished. The Marxians are reformist capitalists compared to the anarchists. the old. They had believed before 1917 that the Marxians had the same object as they, but after the experience and experiment of the Marxian revolution in Russia, which they thought would lead to the suppression of the new state, they have abandoned all hope of Marxians abolishing states. Like Lenin before the last war, the anarchists were also against both sides in wars, since both sides were capitalists, but now they are against all wars, between one or more capitalist states and between socialist and capitalist states. The anarchists refuse to recognise territorial frontiers and therefore they have no fatherland which they should defend. Frontiers means states and since they want no states, frontiers do not exist for them. Only undivided mankind exists for them, undivided as a whole and also as classes. Somehow the idea of anarchy or anarchism is associated with chaos and violence——so that the two words are interchanged: Anarchy means chaos. But to the anarchists, anarchy means only order without violence, unenforced order. All state orders are enforced orders, order enforced over chaos. Lift the state and its order, there will be chaos which was kept hidden. The anarchists are as much against chaos as those who pretend to be against chaos and therefore justify and maintain the states, any kind of state. They say that chaos cannot be abolished by states, but only kept suppressed, hence they require armies, police and prisons with or without constitutions. Keeping chaos suppressed means not preventing chaos—the order that is imposed has only suppressed open chaos. The anarchists try to prepare the minds of people how they can live without chaos and without states. For there is no question of imposing anarchy upon the people as the Bolsheviks, capitalists and Fascists try to do “in order to prevent chaos,” as they think. For the anarchists do not try to impose any state nor to establish any armies, prisons and police at the expense of the people. The minds of people being addicted to states, the people are likely, nay bound to welcome a new state in place of the old or hated one. The anarchists tell all that a new state can only make the conditions worse. But the old states cannot also be maintained, hence chaos. The anarchists want to tell that if people wanted no violence from above, they should organise themselves without violence, to prevent a new violence being imposed by others. The only way to prevent a new violence being imposed is to organise themselves without any state! That is anarchy. But the minds of men are predilected to slavery and therefore they accept or help in the imposition of a new state after the old one is destroyed. That is why they suffer more and more after every revolution. Anarchists are not responsible for chaos if it comes, but states are responsible. The anarchists are against killing or imprisoning even one man or woman. They want no killing in the name of any idea including their own and no prison for anyone. Hence they neither want wars nor civil wars and take part in the latter only as a defence measure. Or because they could not remain neutral owing to both sections in civil wars treating them as their enemies, which of course they are. They refuse to take part in any so-called “revolutionary or society Government"—-for them, there can be no revolutionary government or socialist government even if it calls itself “communist”! There is either revolution or government, not both-—-since both cannot be combined. We have already pointed out that a socialist or communist government is a contradiction in terms, and therefore the anarchists refuse even socialist and communist governments as false and illusory. They are as much against the socialist and communist governments as against the capitalist ones. They consider that every government that takes the place of an older one will do worse. Will be more dictatorial or more lying and cunning and cruel and deceptive. The remedy for one state is not for another but the abolition of all states. The anarchists argue that all states must necessarily be static, i.e. must prevent progress. All states are therefore reactionary apart from being dictatorial, The society alone can be dynamic and the states want to prevent social dynamism. Otherwise, there would be no justification for the states. It is claimed by all states that they have furthered progress. Either it is a lie, or it is true, that is in spite of their statism and reaction, because they could not prevent it. ‘The society is continually marching forward, but the states in order to keep their power are acting as breaks upon society, till at last a new revolution becomes necessary or a break-down -of the state is inevitable. There is no virtue in any state in the sense that it helps social dynamism. In proof of this, every constitution says: Thus far and no further! When a state is established, every action or development calculated to upset it becomes revolution and “treason to the people”, i.e. to itself, however inevitable, justified and necessary such actions or developments may be and are. That is because the state which means “standing” cannot afford to be dynamic with society. It is generally supposed that laws create changes! But laws are but seals put upon facts. No law comes till the people have taken the law as it were into their own hands——for the arguments of governments is that the people are not ready for it and will consider it too radical. If laws create changes in progressive direction, monarchies must have been abolished by their own laws and republics must have made socialist laws and socialist governments so called must make laws abolishing their own states. No. They prevent and if necessary bloodily suppress every change in the direction of progress, for if progress came their states will become unnecessary. Monarchies and republics were first established by force and bloody fights and they can be abolished only by force, unless they die of inanition i.e. economic break-down. They will never make republican, Socialist or Bolshevik and anarchist progress but each will prevent the next step whatever the consequence may be. Somebody or something must pull them down before progress is possible, for progress means losing the power and means of existence for statesmen. After every so-called revolution leading to the establishment of a state, there was a reaction. Revolutionaries were “purged” by revolutions, because the purged wanted what the states could not have or give. That is the consequence of revolutions for new states, which means new reactions. The anarchists want a social revolution, not a revolution for state formation: They want the society to own all things instead of giving them to a state however radical or revolutionary it may call itself. They believe that salvation and solution are only in social ownership of all things. They not only refuse to take part in state power, but want to prevent the rise of any “political power" for any or all the groups who want to capture the state and its force. Therefore they are against all political parties ‘which want to capture power together or separately and therefore against all parties and partisanship. Political and state power can only be at the expense of the people, to deceive and exploit and suppress the people. For politics is parasitism. 'Even so-called revolutionary and communist politics. They do not claim that one state is better than another and therefore must be supported against its enemies. So far as anarchy i.e. non-violent order is concerned, all states are equally united. against it. There can he no better and worse among them so far as anarchy is concerned. It is true that the anarchists had been requested towards the end of the Spanish civil war to send a representative into the Catalonian government and they sent one. But the representative was not willing to join in collective responsibility, for it would be against anarchist objection to all states. The anarchists were placed in the same position as the democratic and left wing parties of Spain by the civil war made by Franco, and the anarchists were as much in danger as the democrats and left wing politicians. As Franco could not be fought except with weapons, the anarchists had to take up arms and help the republican armies composed of democrats, socialists and communists who wanted to maintain states. Otherwise, the anarchists had to give up fight against armed Franco! Of course, the anarchist 'troops tried to fight as separate units of the army which the other parties did not like and under the name of unified command they coerced the anarchists to submit to non-anarchist command. The anarchists submitted to it owing to the common danger to all. The communists who had most influence with the republican government and finally became masters decimated the anarchist troops and members as they were unwilling to submit to total centralism. In this act, they did as Franco would have liked. The anarchists practiced what is called (in India) responsive co-operation with fatal results to themselves and with the defeat of the left wing politicians also. The anarchists were decimated both by Franco in front and communists from behind. Next time they hope to be more careful and prepared. The charge of violence against anarchists is due to several attempts made before the last war against the lives of ruling presidents and kings by those claiming to be anarchists. Nobody denies this. But terrorism is not peculiar to anarchists. It was practiced by nationalists of various countries, by the social revolutionaries of Russia and even by Nazis and monarchists who all wanted states of their own and therefore could not be expected to take lives of statesmen. In a desperate state, all parties and many groups are likely to resort to terrorism, for no other activity is allowed to them. If people are prevented from making open propaganda, they will make propaganda by action, by terrorism. But since the last war, the anarchists had opportunity to propagate their views, even though at great risk, and therefore they abandoned terrorism. Most of the terrorists were not even anarchists although called by the vile press such, and some may have mistakenly taken themselves to be anarchists. All that does not prove that anarchism thrives by terrorism and terrorism is its only propaganda method. Many bandits and robbers were called by the vile press terrorists and anarchists who wanted chaos or only thought that their actions were “anarchist”. The Bolsheviks who wanted a strong state also practiced bank-robberies to fill party coffers. Some bank robbers might have had accidentally some anarchist acquaintances but that does not make them anarchists or all anarchists (or their bandit acquaintances) alike and the same. Moreover some individualists who claim to be anarchists because they do not want any state may feel justified if they resorted to terrorism. But anarchists do not want terrorism either by the state or by individuals and parties which are usually organized and even justified by states against their opponents. Anarchism and terrorism are two different things, terrorism is prevalent among non-and anti-anarchists. States consider “the ends justify the means"—the anarchists don’t. But some anarchists may be mistaken some time, which is no proof against all anarchists or against anarchism. In fact, I have met one terrorist nationalist who called himself “anarchist” taking cue from the denunciation of the police and papers. When I asked him, if he did not want any state, he protested: No, we must have a strong national state! If that is anarchism, the anarchists are not for it. Since the object of the anarchists is the overthrow of all states, armies, police and jails which are possible only with the help of arms, their object is destruction of all arms and refusal to bear arms. They are absolute pacifists and humanists. Arms corrupt and blunt the mind-—that is anarchist standpoint. Hence they refuse to have any chance to use or make arms. Anarchism is the only way in which arms can be made and will be made superfluous. All other conditions of society will necessitate and facilitate making arms, and using them, for they are rulerships of a part of society over the whole made to suppress revolt. The states are with the Bolsheviks and Fascists in justifying use of arms. The anarchists want to see anarchist society established not with the help of arms and soldiers but by social solidarity. As they do not want to see a state established by themselves or others over and against the society, they cannot and do not require the use of arms. They know that those who use arms against all others will establish their rule, state and dictatorship over all others which they want to prevent being done in order to make anarchist society possible. The anarchists appeal to social solidarity and social strike against all states and armies. The anarchist society can be established only by direct action on the economic field by all, or by most people. They call for strikes, boycott, civil disobedience social strike or general strike to make states impossible. The trouble is that others want only partial strikes and boycotts for partial objects or political strikes and against some state in favor of another. So long as there is no social solidarity, therefore no social strike, there will be no society and any set of armed men will be able to rule all. So long as people believe in governments, they will be victims of all governments, the people’s will being paralyzed by the idea of governments. Only they will change one government after another and will be prey to all of them. The anarchists say to make a strike, even a general strike or social strike, only to change governments is suicidal. Of course, a general or even a partial strike and boycott may weaken to some extent some of the governments. They are in sympathy with all strikes, because it demonstrates the will to resist, but that is not enough to abolish tyranny or exploitation. Finally the strike will subside. A total strike to abolish all states must be the final object of mankind. Otherwise, life will become worse and worse for all. Every armed revolution will fail to emancipate mankind from thraldom, economic or political, for a worse government will take the place of a bad one, just with help of armed men. Only society can emancipate itself from all governments and miseries. What is the use of government if there was social solidarity? The society can do all the functions which governments have arrogated to themselves. In fact the anarchists’ object is to take away the functions of governments - especially the useful functions by the society, not by themselves. If the society has to protect itself, why establish a government and ask it to protect it against malefactors? It can do it itself by delegating some to do it. Once Gandhiji said: Why appeal to municipalities or governments to have the lamps lighted? A few persons can walk along and light the lamps. That is social self-help. Similarly every service can be organized by the society itself and organized under its own control. That is what anarchism and anarchists mean. The anarchists do not want rights of society surrendered to any set of rulers. That is crime against all states and state-makers. Naturally that cannot be done except in a decentralized and localized manner. States are the enemies of decentralism and local self-organization, no matter what state. That is why the anarchists are against all states, whatever the form. The anarchists argue, since all production is based on raw materials and work, where does the state come in production or services? The society can organize itself to do all these without parasitism by the state. It can do better than the parasitic state. It can organize all social services and employ everyone. Why not? The anarchists are not against centralized planning of production but against centralized methods of distribution by delegating “authorities”. The anarchists while they are against “rule” (rulership), believe only in agreement as the solution. Localities agree what is the best method or plan of production and distribution and how best the products and services should be distributed. That will be quite enough to set about working and distribution of work, goods and services. No complicated contracts like constitutions and its paraphernalia like oaths and elections are necessary for the essential social services to be performed. All have to see what is the best for oneself under the circumstances. Contracts like constitutions can only be enforced, taking advantage of and even creating bad conditions. Free men will never make contracts. For the circumstances may change and one of the parties in the contract will get no benefit by improved work. Moreover contract presupposes master and slave, so that the party in need may be coerced into a disadvantageous contract. The idea of social contract leads to rulers and ruled. For there must be a third party to enforce the contract, whatever the disadvantages to one and advantages to the other party. Hence the states arise as arbiters as of necessity. If something is in one’s interest, all will agree if the same advantage accrues to all. People must learn by doing, i.e., serve themselves in combination with all instead of leaving it to some delegate as “authority” and abide by his decisions, whether it will be advantageous or not to all. Anarchist society is an education itself to all, for all act and serve themselves instead of leaving responsibility to some and taking orders. It instills responsibility in everyone-—-for he may suffer if he is not careful and intelligent in the choice. State makes people irresponsible to themselves and others. What does it matter if others suffer provided, I am safe and the state protects me better than others? That is slave mentality. People can be bought to do anything, however odious and nefarious. Under anarchy, such things will become impossible, for each is master of his own destiny and has equal rights with all. The motto of anarchism is each for all and all for each, and an injury to one is injury to all! That is at least what they strive for. Beyond this, there is no object. Of course anarchists, like Marxians and capitalists, differ as to the method of achieving their objects of social welfare. In fact, economic theories of anarchism have been different and not fully developed. That is why most people could not be convinced that anarchism “would work". But that is not proof that other systems will work, although they have been maintained by force and fraud till they broke down or were over-thrown. There is every certainty of other systems breaking down on account of state and parasitism. Hence anarchism can be worked economically. all must be right and possible to work, that is anarchism, especially anarchic (social) communism. State communism is not socialism, even according to Marx, Lenin and Stalin. It is claimed only as “transition stage". Communism is possible only when the State of the Bolsheviks “withers away". That is Lenin's theory. That means communism is beyond state, not earlier. That is, after the state withers away or is abolished. All the socialism claimed by states is but capitalism. State and capitalism cannot be separated. If capitalism is bad and unworkable, then anarchism and communism alone can be right and workable, and good. That is the logic, not saying that it is both capitalist and socialist and communist. Shutting eyes to logic will not straighten things, will not make the impossible work. Not that anarchism is not workable but that men do not want anarchism since they want states. If capitalism and Bolshevism are bad, then the enemy of both—-anarchism must be workable, good and desirable. Then they say shutting their eyes and mind, Bolshevism is only a passing stage and some day communism will come. That is shutting one’s eyes and mind against “solution”! Either we wait for solution or we make the solution! The one is fatalism and the other :h-ee will. Anarchists believe in conscious acting in favour of what is inevitable. They have no transition stage—except social strike and social solidarity against states-—as offered by capitalists and Bolsheviks. But people seem to want a state as a transition or bridge and wait, and suffer! That is not the fault of the anarchists. They do not intend to rule by violence and therefore do not want to capture but smash political power and power seekers. They want power only to the total society. The anarchist ethics is: Instead of ruling men, men should administer things. But that cannot be done with the help of any state, for all states are bound to be parasitic. People want to help parasitism, submit to it instead of overthrowing it, only they want change of parasitism called revolutions. But no revolution will succeed till all acquire bread, room and raiment. The revolutionary governments only supply these to those who serve them to maintain their power, taking advantage of the necessities of life. That will produce parasitic states. If the people took hold of the necessaries of life (expropriated) and made use of them for all, instead of letting the revolutionaries take and monopolize them (confiscate) and distribute them according to their desire to get supporters for their state, then production without parasitism can proceed. ‘Until that is done there can be no emancipation of man from the tyranny of states. Hence the anarchists call upon workers to expropriate the works and use them for the benefit of all. The bread problem is the first revolutionary problem, both for anarchists and state-makers. Without this—i.e. without social solidarity to prevent bread from going into the hands of state-makers, there will be either chaos or states. There can be no political action—either politics or action! Action is only in economics. Consistently with their anti-state and anti-authoritarian attitude, the anarchists (who call themselves also libertarian or free socialists) stand against politics and political parties, making propaganda against parliaments and elections to that centralist authoritarian body. Their theory is, according to Michel Bakunin, once a noble of Russia who formulated the anarchist principles, that “Politics is the theology of the State” (in his “God and the State"). Politics and political parties dissipate and divert the mental and other activities away from the main issue which is economic well-being. They want to set up and capture “political power" in the State as an essential condition of economic well-being of the people. But the means become the objects so that the state well-being becomes the first and last consideration of politicians and statesmen to the neglect of economic well-being. Therefore the anarchists warn the people against becoming involved in politics, state form and political parties against their own interests. Economic betterment can only be brought about by direct action on the economic field by the people themselves, not by voting for any or all parties who want to have a say or power in the state. The general or social strike must pave the way for social (economic) revolution with the object of an anarchist society being established. Only then there will be freedom, democracy and socialism. All the rest is illusion and dissipation of energies in trying to realize a chimera. There is going to be either a state or socialism and not both. A socialist state is a myth! The people alone can emancipate themselves, not through any politicians, state or statesmen. Office corrupts men. Especially under centralism and authoritarianism. The problem of abolishing tyranny, corruption and deception is not so simple as authoritarian statesmen and politicians suggest. “State is source of crime and corruption,” Aristide Briand said in the Chamber of Deputies, of course before he became a statesman, premier and patriot. It is no use establishing a state, any state, and then complaining against evils, tyranny, corruption and deception: The anarchists are realists, matter-of-fact, and therefore refuse to have anything to do with political parties and states and their machinations—except of course to combat them. They refuse military service and propagate against bearing arms. (A broken rifle is their symbol). They are unconditionally for every rebellion against states, whatever state it may be. But they do not support the objects of a revolution if it is to establish a new state in place of old. States make people irresponsible, for they take away the rights of people (freedom) to manage their own affairs. They become mercenaries of the state, doing whatever is ordered and paid for. To make the people responsible to themselves for their own well-being, they must be made to act for themselves. Nobody can serve the interests of another as oneself. But he must have an opportunity for serving himself and that can only be done in an anarchist society: Where he can create his own well-being with the wellbeing of all. Society must become dynamic. Hence no states. members) were in Spain and the Catalonian Republic was more favorable to the Anarchists and anarcho-syndicalists. As in Russia so in Spain, Marxism was a super-imposed organization, i.e., not native to those countries. The First International founded by Karl Marx and later joined by M. Bakunin till its end in 1872 (with Bakunin’s death) defined socialism as the abolition of the wage system. For wage system is the means of exploitation upon which all states, however radical or communist, are based. The wage system is the cause of division in society as classes: the employing class and the employed. State as employers is also a wage-system and an exploiting and oppressive system. It is authoritarian and corrupt. Hence the anarchists stick to the definition of socialism given by the First International which was called the “International Workingmen’s Association”, which is also the name of the Anarcho-Syndicalist International. The anarchist principle of distribution is: To each according to his necessities and from each according to his abilities. Equality does not mean equal wages or comforts for all, but equality of treatment for people under the same conditions: As for example when one is ill or invalid. For example when milk is scarce, equality does not mean equal distribution of milk for all, able, invalid or ill or infant, but supply first to the invalid, ill and infant. The anarchists do not believe that one is mentally proletarian by birth or one is mentally capitalist by birth. For there are many capitalists who are and will be for social revolution even in the anarchist sense, while many proletarians are and will be capitalist or petty—bourgeois and Marxian by mentality. If therefore the capitalists are expropriated by society, it would be wrong to ill-treat them for their being formerly capitalists: Once expropriated, they are practically proletarians and must be treated as such, till they become dangerous to social order. The anarchists do not believe in punishment but only watchfulness and moulding social surroundings. Mind cannot work outside social surroundings. There are religious anarchists and communists like the Tolstoyans and Dukhobors (both Russian) who also stand against private ownership, state and arms-bearing and want to return to primitive Christianity. The anarchists who are atheists have nothing against them, provided in secular matters they do not bring in religion. Religion is a private affair as much as atheism. If sometimes, as in Spain, anarchists converted convents into anarchist universities where atheism is taught, it is not because they were against religion or Christianity but against the Church which was corrupt, tyrannical and fanatical against all else, especially in Spain. The Church stood on the side of Franco! It may be mentioned that Anarchist books by Kropotkin were translated into Japanese and Chinese long before the last war and some of the Japanese scientists were anarchist propagandists and were executed by the Imperial Government as early as 1908. Only in other Asiatic countries] anarchism was not known till now. Some of Kropotkin’s works were translated into Gujrati and published by the Navjivan Press about 20 years ago but nobody seems to have studied them as anarchist texts. It appears Kropotkin’s “Fields, Factories and Workshops” was published in Hindi by B. S. Pathik some time after the last war. An Encyclopedia of Anarchism was published in four volumes in France in Paris before the last war, edited by Sebastian Faure. The works of Bakunin in 6 volumes in French have not been translated into English till now, except his “God and the State". The first anarchist publications in India will be “Socialism and the State” and “Anarcho-Syndicalism” by R. Rocker in English first, then in other languages of India, published by the Indian Institute of Sociology, Bombay. A Marathi and a Gujrati edition of “What is Mutualism?” by Swartz have appeared from the same Institute.